"She's still lost in the memory of the Wanderess. The girl, all in red and black, fleeing to find people long gone. What must she have seen, before she fell? The sparkling hills, or the aeroplane; frozen in place but still flying, she wonders what the other side of the crater looks like, what it looked like to the girl who ran away." 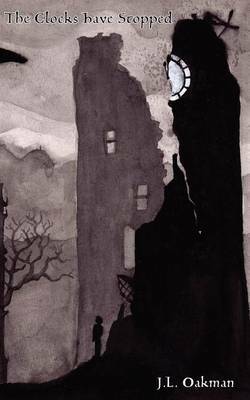 The Clocks Have Stopped is a collection of illustrated short stories and poems by the author of The Fort Knight's Tale, J.L. Oakman. This book contains a collection of short stories and poems exploring time and disconnection; from others, from the world, and from oneself. Via the lens of sci-fi and fantasy writing, J.L. Oakman asks questions of the reader, and exposes answers about himself. J.L. Oakman is a Sussex based writer with a love of the strange and the original. More of his work can be found at www.fortknightstale.com "And off they went, a young woman, fascinated with the world, a mother, worried only for her son, and a young man, desperately wishing he could find some clothes."